If anyone is a poster child for the contribution that immigrants make to the American “smorgasbord,” Angela Bannerman Ankoma is a strong candidate. Meet Angela Bannerman Ankoma, one of seven winners of our 2015 Dorothy Richardson Resident Leadership Award, who helped her community in Rhode Island improve their eating habits with a new weekly market that promotes healthy foods and art. 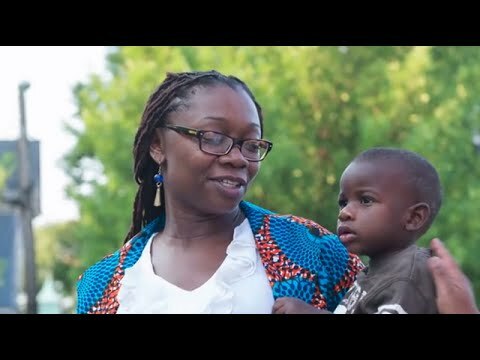 Her parents came to the United States from Ghana, “looking for an opportunity for a better life.” They found it, but have given back in spades. Consider their daughter, known to her friends as Angie. Angie spent most of her childhood in the West End neighborhood of Providence, RI, and returned after earning her master’s degree from Columbia University. She began a career in public health that culminated in her work today as chief of the state’s Office of Minority Health Initiatives. If there is one contribution that best encapsulates Angie’s “gifts” to her community, it is the Sankofa Initiative ̶ designed to achieve several vital goals: healthier communities, inclusive diversity and grassroots economic empowerment. The starting place for the initiative, a project of NeighborWorks’ West Elmwood Housing Development Corp., is a world market. The original idea came from Angie’s observation that after the many immigrants and refugees in the area have lived in their adopted home for a while, they slowly become less healthy ̶ in part because they no longer have access to their traditional produce and spices. Eating healthy already was a challenge because the West End has historically been home to the lowest income levels in the city. Sankofa is a Ghanian word that translates to “go back and get it” ̶ in other words, go back to the roots of immigrants’ culture and grow the foods upon which they were raised. Through Angie’s leadership, the Rhode Island Department of Health’s Centers for Health Equity and Wellness awarded West Elmwood $300,000 to make the weekly market a reality. The “celebration of food and culture” brings together local ethnic growers, craftspeople and other community members to offer both art for purchase and healthy foods that are affordable and culturally appropriate. At the same time, the market is transforming the neighborhood into a “cultural mecca” that attracts residents from across the city.